In early March 1997 a surprise telephone call to Fr. 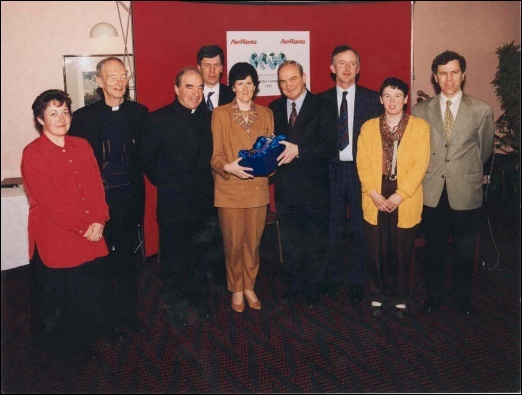 O’Shea Parish Priest of Myshall from the Irish Episcopal Commission for Emigrants brought news that the ‘Myshall Parish Magazine’ of 1996 had won a National competition sponsored by Aer Rianta. Excited members of the committee travelled to Dublin Airport for the presentation of prizes on March 14th and received a beautiful engraved crystal decanter and two air tickets to/from any airport in England to/from any airport in Ireland. How did this come about? First it was short listed by a panel of experts and then the well known author Maeve Binchy had the most difficult task of selecting a winner. On judging the winner she had this to say: ‘When I went to England as an emigrant I very much looked forward to and loved receiving the weekly letter from home – knowing who did what and when and this is what I was looking for when I was judging the competition’ Maeve wanted to know who died, who was born, who got married, what sporting events took place, who could boast an achievement during the year, who retired, who moved abroad, what new initiatives were set up in the parish etc. Because ‘Myshall Parish Magazine’ had the answers to all of these and because it had an attractive cover and an up-to-date account of every event in the parish for the year it was judged the best possible ‘letter’ a loved one abroad could receive. ‘Myshall Parish Magazine’ was founded in 1993 by a small committee with the intention of reaching out to people at home and abroad but its origins stretch back before then as the Parish Magazine evolved from an A4 page of local news that was sent to emigrants as far back as 1968. A small booklet called ‘The Tangent’ followed for a number of years but was dropped in 1984 with the introduction of the weekly newsletter. Since 1993 the publication has included photographs and has been printed professionally. Local businesses support the venture through advertising. Nowadays it is a valuable historical record of all that goes on in the area in any one year, it recognises the valuable contribution each organisation and individual makes to our community, it introduces new residents to the area and it remains a valuable link with our emigrants. Historical articles have been recorded on Mass Paths, Holy wells, ballads, local cures, forges, 1798 archival material to mention but some of the topics covered over the years. We have been very fortunate to have had the opportunity to feature, since 1993, two centenarians and the rise to fame of local heroes like Danoli, Richie Kavanagh, Dee Side etc. The magazine is for everyone young and old alike as there are special competitions for the local Primary school children, documentation of all the activities teenagers become involved in and of course those who are housebound or in hospital look forward so much each year to the magazine that the demand always exceeds the supply. It is an opportunity to showcase our parish and its production would not be possible without the co-operation of everyone in the community. The theme of the Magazine’s float in the 2007 St. Patrick’s Day Parade was ‘Home and Away’ because the magazine is sought widely both at home in Ireland and all over the world – ‘sa bhaile agus ar fud an domhain’.